I guess the seed gods knew it was Grubarazzi's first birthday today so they sent me natures closest interpretation of a balloon bouquet.This strange little Mexican fruit is delicious straight from the plant, blended in to salsas, cooked in to chili, or fried like a green tomato.So many options so little time. I also despise following the rules so instead of making a cake to celebrate one year of blogging I made spicy Chicken Chili Verde instead. Happy birthday, Grubarazzi! You keep me feeling inspired and creative. A big thank you to everyone who has visited and commented over the last year. Without your friendship and cheers Grubarazzi would be lying in an alley somewhere, cold, shivering and alone. Preheat the oven to 450 degrees. Arrange chopped onions, garlic, bell peppers, jalapenos, chilies, and tomatillos on a large baking sheet cut side down. Drizzle with olive oil and salt. Roast on high heat for at least 20 minutes until caramelized. Remove and allow to cool; about 10 minutes. Transfer the roasted vegetables to the blender, blending until smooth. Set aside. In a large Ziploc bag toss chicken pieces with corn meal, salt, pepper, oregano and cumin until coated. Heat olive oil in a large heavy stock pot over medium-high heat. Add half of chicken to pot and sauté until golden brown, about 10 minutes. Transfer to a bowl. Repeat browning process with remaining chicken. Return all of the chicken (including its juices) to the stock pot. Add blended vegetables, chicken broth, corn, oregano, chili powder, cumin, paprika and cinnamon to pot. Bring liquid to boil. Reduce heat and simmer until mixture thickens and flavors blend, stirring occasionally, about 2 hours. Season with salt throughout the cooking process to taste. Mix cilantro into chili. Transfer to large serving bowl. Garnish with slice avocado (or your garnish of choice) and serve. Happy Blog Birthday! I couldn't be happier that I found your blog. You post the most delicious-looking creations. I can't wait to try this out. Maybe with tempeh? 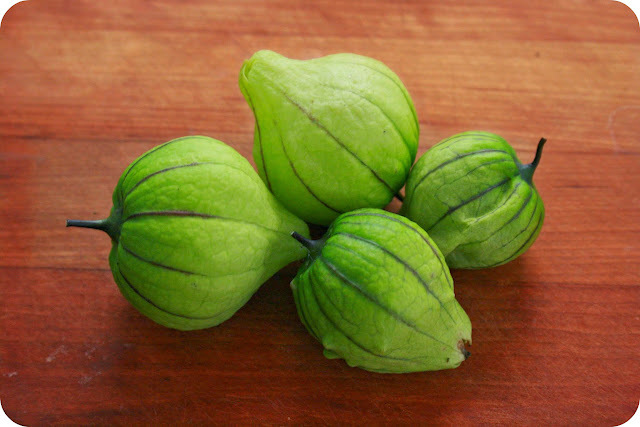 Tomatillos are the best! Thank you! I'm so glad I found yours as well. So inspiring! If you make this with tempeh it would be a much faster verde. Sounds yummy too. Looks like something we'd make here in Texas! Yummilicious! You're so cute, did you know that? Happy, happy birthday to your blog!!! And what a coup to have a beautiful crop of tomatillos...I'd love a huge bowl of your chili verde! YUM. Happy blogiversary! The chicken chili verde looks amazing. Thank you! It's been quite a fun year. This chili verde was a big hit at the house. Happy Happy Blog Birthday! 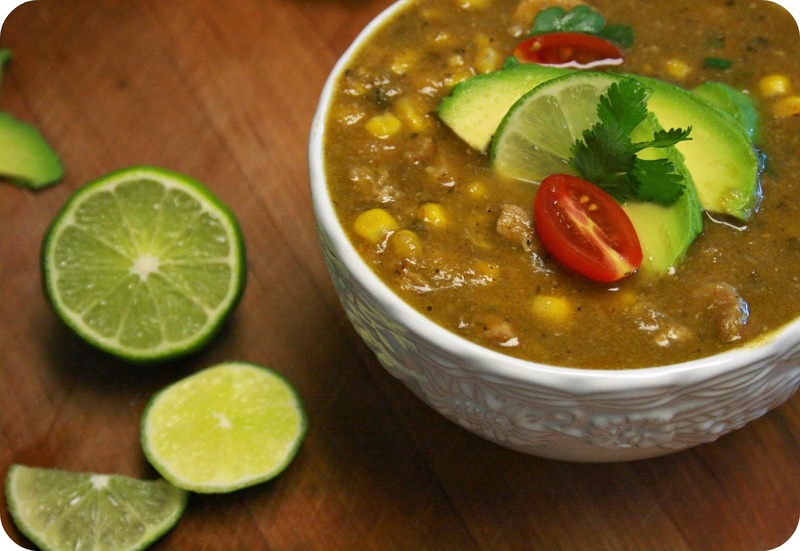 I'd love a bowl of your delicious chili verde right about NOW! What a nice surprise! I need to get some tomatillo seeds next year. Happy blogerversary,,,,great chicken chili's recipe,looks delicious !! Congratulations on your blog anniversary! I adore tomatillo sauces. What a treat to find them in your garden. I hope you weren't too disappointed not to have tomatoes. We love chili and this Chicken Chili Verde will definitely make my family happy! Happy blogiversary! Better late than never, right??? Hugs! More power to you and to your blog! I love Chicken Chili Verde! It's definitely one of my fav chili's and your looks incredible! Have a fabulous weekend!